There are four rules of gun safety that are universally taught. You’ll find them on every reputable gun blog. 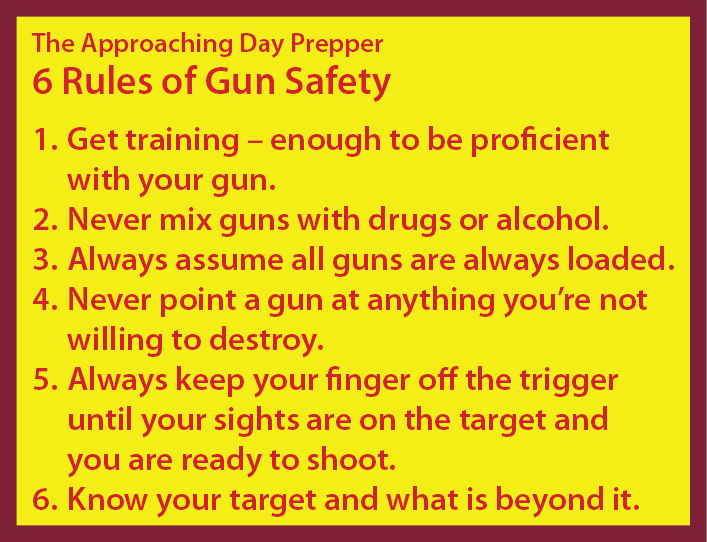 Before I discuss those four, there are two I’d like to add, making this The Approaching Day Prepper 6 Rules of Gun Safety. Let’s get right into them. Rule 1 – Get enough training to be proficient and keep your skills current. If you choose to own a gun, be sure to receive proper training in how to use it. Proper training means more than the first ten-hour basic instruction course. All that a basic class will really qualify you to do is to shoot very slowly at a stationary paper target. Start there, and then take additional courses that teach you how to use your gun in realistic situations and give you practice doing it. These classes will give you training that you probably can’t get at your range, as most ranges only let you do what a basic class teaches you to do — that is, to shoot at a stationary paper target. Advanced classes will give you practice shooting while moving, from behind cover or concealment, in kneeling or prone positions, and while drawing from a holster. Yes, I hope and pray that I never need to use a gun to protect myself or someone else, but if I do, I’m certain that those first ten hours of training weren’t nearly enough to make me competent to use one in a life-or-death situation, which is the very thing that I wanted to learn to use a gun for. On-going training and practice are essential. Rule 2 – Never mix guns with drugs or alcohol. Guns are lethal weapons. There is no place for the use of drugs or alcohol with handling firearms, and by “drugs” I even include over-the-counter medications. One effect of drugs and alcohol is that they impair our judgment and actions. Another effect is that they make us unaware of that impairment. Don’t risk killing or maiming yourself or another person. A few months ago, I had a range date set with Phil and a friend of ours. The friend had come a long way to go shooting us. I hadn’t taken any medications or alcohol, but was experiencing dizziness or vertigo similar to what you might experience after a few drinks. I decided to stay home. My presence on the firing line would have been a danger to me and my friends. We knew someone who had an annual Fourth of July shooting party at his house. He called it “Fireworks – Firearms – Fire Water.” A dangerous combo. We stayed home. Rule 3 – Always assume all guns are always loaded. Even if you know you unloaded it before you put it away, when you get it out again check to be sure it’s not loaded. Then check again. Even if you’ve been assured by the person handing you a gun that it’s not loaded, check for yourself to be sure it’s not loaded. Then check again. Even if you watched someone check the gun before handing it to you, check to see that it’s not loaded before handling it. Then check again. The huge percentage of gun accidents occur because someone thought the gun wasn’t loaded. Always treat any gun you pick up as if it’s loaded. Is the gun loaded? The answer is always “yes.” Even after you’ve double-checked that the gun is unloaded, never do anything with it that you wouldn’t do with a loaded gun. Always treat every gun as if were always loaded. Rule 4 – Never point a gun at anything you’re not willing to destroy. That means never pointing a gun at another person you’re not willing to kill. Even an unloaded gun. (Because as we just learned above, you should assume all guns are always loaded. ) It’s a habit you never want to reinforce. It also means not pointing your gun at your TV unless you’re ready to shell out for a new one. What this means is that any time a gun is in your hand, you must be very conscious of where it is pointed. Yes, even if it’s unloaded, which it NEVER is. (See Rule #3.) Once you have the gun pointed in a safe direction, you must keep it pointed in a safe direction, even if you are moving or you look away or turn your body a different direction. People have a tendency to sweep the muzzle over vulnerable people and property when they move even the slightest bit. Developing good habits with an unloaded gun will carry into good habits when the gun is loaded. Rule 5 – Always keep your finger off the trigger until your sights are on the target and you are ready to shoot. Don’t put your finger inside the trigger guard until you are looking at your target and ready to shoot. A bad habit to develop is slipping your finger onto the trigger as you approach your target. For newbies especially, keep your finger off the trigger! Don’t put your finger on the trigger until you are looking at your target and ready to shoot. Don’t get lax, thinking that the safety is on so there’s no harm in having your finger on the trigger. First, it only develops bad habits. Second, don’t rely on the mechanical safety. It could fail. Better to develop the habit of keeping your finger away from the trigger until your target is in sight and you are ready to shoot. Rule 6 – Know your target and what’s beyond it. Bullets can travel a long way. Depending on your caliber, gun, and conditions, it could travel one or two miles. It’s not enough to know what your target is. What is your bullet going to hit if it misses the target or goes through the target? Know what’s beyond your target before you pull the trigger. In conjunction with Rule #4 (never point your gun at anything you’re not willing to destroy), pointing your gun up in the air is NOT a safe direction. What’s your target? What’s beyond it? If the trigger is pulled while the gun in pointed in the air, either intentionally or by accident, the bullet will land somewhere. You just don’t know what — or who — it will land on. The purpose of the rules are to reinforce behaviors that will become automatic so that you don’t accidentally shoot something you don’t want to shoot. Don’t handle your guns until you have them burned into your memory, and make them a priority in your first training sessions…and always. Women, if you have any interest in self defense (and you should), buy Personal Defense for Women by Gila Hayes. It is informative, instructional and encouraging. And it may save your life someday. No, the book won’t save your life, but it may begin or enhance a journey that one day saves your life. The final half of the book is dedicated to self defense with handguns. I began learning about and training with handguns about a year ago, so I am still a relative newbie. I found her review of the basics to be an outstanding refresher. I especially appreciated the discussion of the mechanics and physiology of recoil. While I have been taught about stance and how to hold the gun properly, I haven’t fully adopted what I was taught because it feels unnatural and quite frankly I was hitting my target better from a different stance and with a different grip. Hayes explained why the stance and grip I’ve been taught is important. It’s an important issue for women. Proper stance and grip minimize the recoil experienced by the shooter. That means my bones and joints are less stressed when I shoot and it means that I can reacquire my target faster. The first can save my body in the short run; the latter can save it should I ever need to shoot in self-defense. Now I’m motivated to let my accuracy suffer in the short-term while I practice a stance and grip that feels more unnatural but is healthier and safer. The special attention she gives to women’s issues helped me understand things from a women’s perspective. For example, I have been struggling with the issue of concealed carry. Having only men around me to offer advice, I’ve developed this response to most of their solutions: “Men and guns have angles; women have curves. Therein lie my concealment issues.” In other words, all their advice worked well for men but not so well for women. Hayes offers practical advice based on her experience and the experience of her female friends. As I said in the first paragraph, I recommend Personal Defense for Women by Gila Hayes. Women, buy it for yourself. Men, buy it for the significant women in your life – your girlfriend, mother, wife or daughters. It’s about more than hand guns – it’s about not becoming a victim.